This has become our new favorite side with pizza. I was inspired one day to make cheesy bread after reading this post. 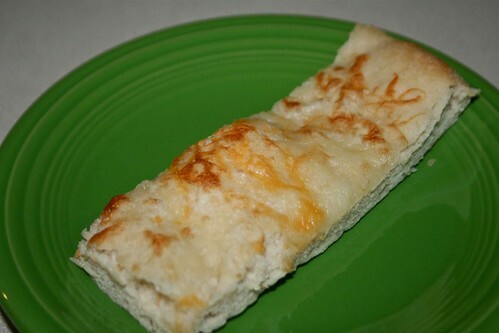 I was craving some cheesy bread when I finished reading and had to try it. I didn't grill it, nor have I ever grilled a pizza (maybe some day), it was boringly baked in the oven. I made the dough in my bread maker, since I'm a failure at getting yeast rise. I used my own recipe but it's very similar to the one on the post. I made enough dough for two large "loaves". (Both times I've made it we had company so please don't think we're total pigs.) The second time I made it (pictured above) I let the dough rise some before baking it. It was better that way, more bread like. It's also yummy warmed up in the microwave the next day. It doesn't sit around long.